Remove any leaves or debris that may have built up around your outdoor unit during the winter and spring seasons. Keep all plant life and vegetation at least 2 feet away from each side of your outdoor unit and make sure to trim any grass or plants that get too close. Place your unit in a shady spot if at all possible. By shading your system, it can prove to be at least 10% more efficient during the summer season than if it were in the sun. Check your filter at least once a month and replace if necessary. Dirty or clogged filters can be damaging to performance ability. Clean your unit’s fan blades and coils at the start of each cooling season. Make sure to clean off all debris from the inside as well and brush off any dust or dirt that may have built up on the the blades or inside the unit itself. 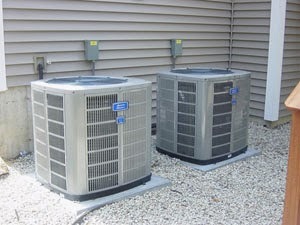 For more DIY tips to help you with your HVAC system, visit the DIY Network. Last but not least, make an effort to schedule an appointment with a professional at the start of every summer to make sure your unit is ready to help you beat the heat. That’s where we come in! With over 50 years of experience, we understand how important preventative maintenance is in order to keep your systems running efficiently. That’s why at Airtech of Stamford, we are available to perform seasonal maintenance checks and offer annual preventive maintenance programs. Start summer the right way by making an appointment with us to have your system serviced; call us at (203) 323-3959 today!